This meeting will take place at the H H Wills Physics Laboratory, University of Bristol, BS8 1TL on Wednesday, 19 April 2017 (the Wednesday after Easter.) It will be a joint meeting between the IOP History of Physics Group, the High Energy Particle Physics Group and the Particle Accelerators and Beams Group, with additional sponsorship from the School of Physics, University of Bristol. The aim of the meeting is to look at the historical and political aspects of the design, construction and operation of the machines, and not so much on the physics results, which are perhaps better known already. The programme for the day is shown below. If you plan to attend, please REGISTER (it is free.) We certainly hope to provide a free picnic lunch for all who register, but if this shoud prove impossible, there are plenty of pubs, restaurants and cafes nearby. 10:00 Dr Giulia Pancheri (INFN Frascati) will speak on “The history of electron-positron colliders: Bruno Touschek, from Wideroe’s betatron to AdA, towards the high energy frontiers.” On February 27, 1961, in the Italian National Laboratory of Frascati, near Rome, the first electrons circulated in AdA, the acronym for Anello di Accumulazione, the first storage ring for electrons and positrons proposed and constructed by Bruno Touschek and a small team of Italian scientists, technicians and engineers. Two years later, in Orsay, where AdA had been transported to exploit the better injection procedure obtained by the Linear Accelerator, Touschek discovered the AdA effect, now called the Touschek effect, and in the following months, the French-Italian team could prove that electron-positron collisions were indeed taking place and that this type of machine could be used at higher energies, paving the way for the many successes of particle colliders. In this talk, I shall recall the main events of how the Austrian born Bruno Touschek learned the art of making particle accelerators during WWII, jn Germany, building a 15 MeV betatron with the Norwegian Rolf Wideroe. Through Touschek’s yet unpublished correspondence with A. Sommerfeld, and private letters to his family, Touschek’s 1941-45 years in Germany will be described. Following Touschek’s scientific life, we shall see how the construction of AdA led to fundamental developments throughout Europe, including the building of high energy colliders in France with ACO, in the Soviet Union with VEPPII, in Italy with ADONE, in the USA with SPEAR, in Germany with DORIS. In 1977-78 Touschek was at CERN, where LEP was being planned. In May, a CERN car took him to Austria, where he passed away on May 25th. This talk will be prepared in collaboration with L. Bonolis, Max-Planck Institute for the History of Science, Berlin, Germany. 11:30 Dr Philip Bryant (CERN) will speak on “The CERN ISR and its legacy” The CERN Intersecting Storage Rings (ISR) were two intersecting synchrotron rings each with a circumference of 942 m and eight-fold symmetry that were operational from 1971 to 1984. The CERN Proton Synchrotron (PS) injected mainly protons at 26 GeV/c into the two rings that could then accelerate to 31.4 GeV/c. Typically, the ISR worked for physics with beams of 30–40 A over 40–60 hours with luminosities in its superconducting low-β insertion of 10^31 –10^32 cm^-2 s^-1. Interest in a proton-proton collider fed by the PS dates back to 1960, when the community was torn between the ‘safe’ option of a more powerful accelerator and the unsure promise of a collider. In 1965, the decision in favour of the ISR opened the door to 13 years of rapid advances in accelerator physics, technologies and techniques. From rather rudimentary beginnings in the 1960s up to the closure of the ISR in 1984, our concepts of accelerator design, engineering and diagnostics and the way experimental physics is conducted changed radically and became to look very much as they do today. 12:30 Lunch. We hope to provide a free ‘picnic lunch’ for all who register, but if this should not prove possible, there are many cafes, restaurants and pubs nearby. 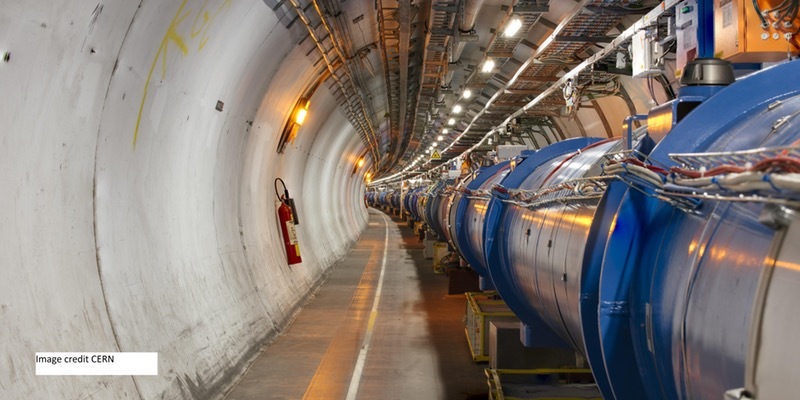 1:30 Prof Peter Kalmus (Queen Mary, London) will speak on “The CERN Proton-Antiproton Collider Project” I will describe the evolution of this project and its pre-history. I will illustrate stochastic cooling and the beam gymnastics of the collider. I will list the experiments, and give some details of the two large detectors UA1 and UA2. I will mention some of the physics that was found at the collider. I will talk at greater length about the major successes at the collider: the discoveries of the W and Z intermediate vector bosons, and relate some anecdotes from UA1. 2:10 Prof Sir Chris Llewellyn Smith (Oxford) will speak on “Genesis of the LHC” I will describe the scientific, technical and political genesis of the LHC. First, I will outline the history of the LHC, from first thoughts and the development of the accelerator experience that underwrote the LHC, through detailed studies of the physics potential and the LHC itself and the evolution of the experimental programme, to the presentation of the proposal to the CERN Council in December 1993. I will then discuss the events leading to the approval of construction in two stages (in December 1994) and later in a single stage (in December 1996), and the negotiations that brought non-Member States into the construction of the LHC in the intervening period. After discussing the initial stages of construction, up to the point of no return, I will conclude by identifying points of potential relevance for the approval of possible future large projects. 3:40 Prof Brian Foster (Oxford) will speak on “Future Energy-Frontier Colliders” The LHC has been a tremendous success, but what is to come after, or preferably overlapping with, the LHC? I will review the main proposals for the future of particle physics, concentrating on those that could be realised soonest. We recommend you travel to the meeting by bus, since the University car parks are all in use during the week. Buses no.9 and no.72 from Temple Meads station stop right outside the Physics Laboratory. There is a multi-storey (paying) car park at Park Row/Trenchard Street and another at Berkeley Place, at the top of Jacob’s Wells Road. Both are just a short walk from the Physics Laboratory.